Table tennis glues - Which glues are there? What is recommended? Table tennis glues - Classifications and differences - This is how to glue! The assembly of a table tennis bat also requires table tennis glue. First, the glue is evenly distributed on top of the blade and rubbers. Second, the TT glue dries, and third, rubbers and blade are put together. The following table tennis glues have the designation "VOC-free". This means that they are free of volatile organic compounds. Such table tennis glues are available since 2008. 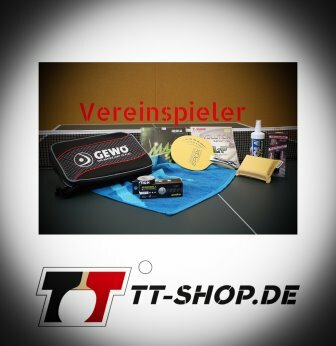 In this year, there was a new rule introduced to the world of table tennis: Glues containing organic solvents were prohibited. The background for this rule is the following: In 2005, Andrzej Grubba, a Polish table tennis player, died of lung cancer. The assumption that the disease might be related to the use and inhalation of (volatile) solvents (which were very common at that time) was subject of many discussions, for a long period of time. And indeed, those chemical compounds were proven to be harmful to health. As already mentioned, such chemicals are prohibited now, and one easily recognized the new type of TT glue because its smell is not aggressive and acrid anymore. 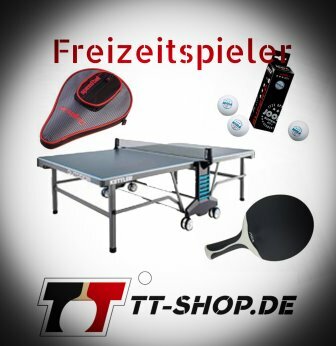 TT-SHOP.COM recommends to use VOC-free table tennis glues to assemble table tennis bats. However, it shall be mentioned at this point that the new glues exhibit a far stickier behavior than the old glues containing solvents. Therefore, quite often there are problems when removing the rubbers from the blade: The blade may be damaged! For this reason we strongly recommend you to seal the blade before gluing the rubbers on that blade. Donic Vario Clean: TT glue with the best price-performance ratio, suitable for coarse-pored sponges, such as Bluefire, Evolution, or Rasant rubbers. Please, always apply two layers of glue! TT Revolution No 3: This table tennis glue exhibits a very good quality. Furthermore, the glue is easily removable from the rubbers! Stiga Attach Power Glue: A very good glue from Sweden. Nittaku Finezip: The best glue, with Nittaku being a Japanese company. Gluing a table tennis rubber is not very difficult, and you don´t have to be a professional TT player. In case you do not have much experience in this, you only need some more minutes. And, of course, we encourage you to read this instruction in order to avoid mistakes. At first, the right equipment is very important. You definitely need your table tennis glue, scissors (or a cutter knife), and -ideally- a solid ground which is not sensitive to cuts (this can happen when using a cutter knife). The next step would be to check out the sponge of your rubber. Most table tennis rubbers exhibit small(er) pores at the bottom. Others, such as the Andro Rasant, Donic Bluefire, Tibhar Evolution, or the Joola Maxxx, exhibit (very) large pores. Such coarse-pored sponges usually need two layers of glue in order to show the best possible gluing effect. Of course it also works when using viscous glues for table tennis rubbers with small pores. Similarly, when using two layers of the Donic Vario Clean, also rubbers with coarse pores stick very well. The first important thing is that the glue must be evenly distributed onto the rubber. The same is true for the blade. Commonly, VOC-free glues are white directly after their application. In the course of time (when the glue is completely dry), however, it is becoming transparent. Then, the second step can be performed, see below. In case your rubbers are small-pored, one layer of glue for both the rubber and blade is usually enough. In case of coarse-pored sponges, however, the rubber should be treated two times. When doing so, make sure that the glue is completely dry before applying the second layer of glue. For the blade, one layer is sufficient (glue the blade together with the second gluing of the rubber). The next step is to use a pressure roller (or your arm) in order to (slightly) press the rubber on top of the blade. After this, protruding portions of the rubber which overhang the edge of the blade are removed using scissors or a cutter knife. All the necessary utensils can be found here. In the world of club and professional table tennis, speed gluing is a well-known term. But also in lower leagues this approach is well-known. Speed-gluing is a technique that produces an increase of surface friction of the rubbers. Then, the rubbers are not only more spinny and more catchy, they are also faster and a bit louder! When speed-gluing, the rubbers are glued onto the blade immediately before the game. Speed-gluing means that the rubbers are glued on the blade immediately before the game starts. This is done using a glue that contains highly volatile solvents (e.g. benzine, trichloroethylene, ethyl acetate benzol, and other aromatic hydrocarbons). This glue is distributed on top of the blade. The whole rubber (hence also the sponge) are placed directly on top of the blade, whilst the glue is still wet. Consequently, the volatile solvents diffuse through the sponge until they reach the surface of the rubber. Finally, the whole rubber swells and becomes more and more elastic. These changes last for about one hour, sometimes longer. After this time, it is necessary to speed-glue again. This, however, happens at (large!) expenses of the durability of the rubbers. Since the volatile solvents also damage the blade, they were usually painted using a protective coating. As already mentioned, the effect of speed-gluing is that the rubbers become more elastic and start to swell. This causes an increased mobility of the outer surface with respect to the swollen support: There is more slidability. When e.g. a topspin ball hits the speed-glued rubber, it exerts a shear force toward the rubber, resulting in a sliding movement. This causes a sort of energy absorbance (storing energy, almost like a spring), which is subsequently released leading to an increased amount of ball rotation (spin). Additionally, speed-gluing considerably increases the adhesion between ball and rubber (improved grip), which also increases the amount of spin. Compared to rubbers which were not speed-glued, speed-glued rubbers may exhibit increases in rotational energy and ball speeds of 10-70% and 5%, respectively. Also, speed-gluing changes the sound when the ball hits the bat: It is louder, higher, and sometimes also "glassy". This may also cause psychological influences regarding the opponent. Note, however, that speed-gluing also occurs at the expense of ball control and precision. As partially mentioned earlier, the disadvantages can be summarized as follows: Speed-gluing significantly deteriorates the durability of the rubbers, and blade (if not coated). Furthermore, ball control and safety during the game are also impaired. Due to the volatile properties of the solvents used, the typical speed-gluing effect disappears just after one or a few hours. This causes the need to "re-speed-glue" the rubbers over and over again. However, dosage and an exact timing are problematic since the effects of speed-gluing emerge at different speeds, and also volatilize at different speeds. Additionally, even within one single rubber, the properties are not always evenly distributed after speed-gluing. The biggest issue, however, are health-related problems. Volatile solvents are associated with properties that are dangerous to your health! This is not only true for skin contact, but also when inhaling such substances. For all these reasons, there is a general prohibition of speed-gluing. 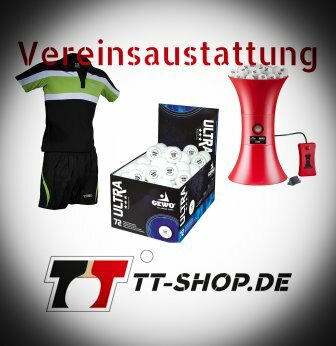 Based on the above mentioned disadvantages, in September 2006, the International Table Tennis Federation (ITTF) announced that speed-gluing is prohibited in closed rooms. Since September 2008, the whole process and application of speed-gluing is completely prohibited. As you can imagine, after the prohibition, there was much research and tuning going on. Manufacturers treated their rubbers in such a way that there is a speed-gluing effect (without speed-gluing them, of course!). For this, many brands also used special table tennis glues, however, without the forbidden solvents. This effect lasted longer (some weeks) than the former speed-gluing, however, in 2008, this procedure was also prohibited by the ITTF because there were still some harmful substances in use, and the additional tuning of the rubbers constitutes an illegal follow-up treatment. Now, there are established rubbers available which are classified as having an "integrated speed-gluing effect". These do not need to be treated in a follow-up manner. However, the ITTF dictates certain limiting values: 3 ppm (parts per million) for organic volatile substances must not be exceeded. It shall be mentioned at this point that the prohibition of speed gluing and additional tuning do likely not reduce the speed, attractiveness, and appeal of table tennis. This is because nowadays, new and innovative rubber compounds already reach similar properties.